Immersion is a new buzzword for scholars of emerging technologies, and for anyone who feels haunted by the arrival of technologies that enhance our experience of augmented and virtual reality. In today’s highly aestheticized life, an increasing desire for immersive experience often leads to ever bigger disappointments. 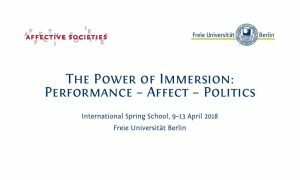 In order to analyze multi-layered phenomena of immersion, as an aesthetic strategy as well as a power technique, Rainer Mühlhoff and Theresa Schütz from the Collaborative Research Centre „Affective Societies“ of Freie Universität Berlin organized the first International Spring School on The Power of Immersion. Performance – Affect – Politics. It took place from April 9th to 13th 2018. 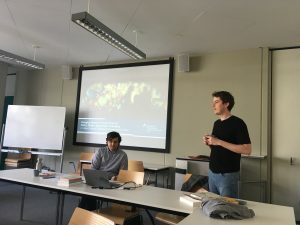 With the participation of 30 international MA, PhD, and Postdoc students from various fields such as philosophy, theatre studies, fine arts, sociology and psychology, and lecturers coming from the fields of affect studies, theatre studies and political science, the workshop presented a deep and multi-perspectival view of how immersion theoretically can be tackled. Even though we can rely on approaches that tend to introduce a taxonomy into immersion studies (see Calleja 2011) and also on various approaches of how to study multisensorial environments that are „transporting“ the subject immediately into another context that can b e inhabited, the Spring School was rather concentrating on affect theory. First, theatre scholar Theresa Schütz, one of the two organizers, introduced a selection of contemporary „Technologies of Immersion“ that affect our senses in a manipulative way (e.g. metacookies, an augmented reality tool that – due to memory of taste in combination with visual triggers – creates a sensation of eating several special cookies although it’s the same ‚tasteless‘ prototype all the time) as well as artistic examples of immersive environments involving recipients in fictitious worlds. How do we actually feel when inhabiting and slowly acknowledging that we are part of an immersive environment, how to get aware of the subject’s actions in correlations with this very Environment? Greg Seigworth explored in his presentation the question of how the subject can reflect on VR and whether this reflection somehow creates a creates a distance from the immersive situation. For him, the trajectory of the subject in the infinite line of immersion always depends on the „affect baggage“ that one carries, that is, the affect-history of the subject in relation to stimuli. On how to approach also one’s own affective dispositions in situations of immersion, could be explored in various practical excercises during the Spring School: For example, through imagining stories about different affect related concepts (designed by Greg Seigworth), through participationg in a game theatre format (designed by Adam Alston), in an immersive fictional climate party (a performance installation created by Jos Porath and Melody Pasanideh) and an eye-contact experiment (led by Eva Holling, referring to Marina Abramovic‘s The Artist Is Present). In all these „exercises“ the participants had to make decisions on various levels, and all these decisions, however fictional they were, were actually pointing out how affects can work. According to Greg Seigworth, our „in-between-ness in the world“ can be tackled if we look at our coexistence/immanence with nature by following these three modes: (1) the point, which is the encounter point, (2) the line, the continuous line of variation, which represents our trajectory of going through these points while affecting and being affected by those points, and (3) the plane, the plane of immanence or the field of immersion that gathers all these lines. The participants reflected on these modes while taking part in various excercises. There are many fields to which the plane of the immanence can be applied, such as theatre, work places, and also nudge Theory. Mathew Arthur from Vancouver School of Theology presented examples of practices of Canadian indigenous people (e.g. in art and protest culture) and showed how actually we could focus „beyond the lexical orbit of affect theories and theologies“ on the Indigneous animism and the future projections of it (using the word of „animism“ as we do not have a better expression yet). Mathew’s approach in a way could be interpreted as a stand for indigenous beliefs, but on the other hand these thoughts echo the object-oriented ontological approach, namely that human existence shouldn’t be privileged over the existence of nonhumans. The question of how affects can be „(mis)used“ in individual decision-making processes in everyday life, which have been raised especially in the sessions of Rainer Mühlhoff and Robert Lepenis had (at least for me) highest relevance: Rainer Mühlhoff has researched different work places of huge multinational corporations where the workers are engaged in processes of collectively shared responsibility within environments that pretend to be more for leisure than work. Robert Lepenies presented the concept of nudge theory, which is a young concept but one which is already adopted in several governmental strategies. Nudge theory is related to architecture, public policy, health care, working culture. Decision makers are trying different ways how to have an effect on individual decision-making in order to stir these decisions towards a certain direction. These strategies can be conceived as a mode of how to – invisibly – lead masses to make choices that help them to live a healthier, ecologically or economically life, but it also could be conceived as highly manipulative. 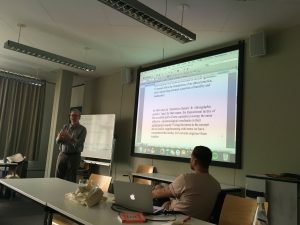 The emphasis of the five-day Spring School was on affect and how we can approach the notion of immersion through affect, and what kind of affective impact a subject needs to start to inhabit the imaginative structure of the situation. On the last days of the discussion, however, new notions also appeared that were briefly discussed, such as the question of empathy, and the interfaces or tools that are amplifying the desired immersive effect (by the creator). If time had permitted, surely there would have been further discussions on how actually new technology tools can or cannot fulfill the subject’s desire of „total Immersion“ (whatever this might actually be). (English) Ágnes Karolina Bakk (1986) graduated from Theatre Studies and Hungarian-Finnish Department at Babes-Bolyai University, Cluj, Romania, and later acquired her MA degree in Theatre Studies from Károli Gáspár University, Budapest, Hungary. In 2015 she was member of the organizing committee of IETM Budapest meeting responsible for the new technology sessions. She is the founder of the performing arts&new technologies blog: zip-scene.com and she is currently a PhD student at Moholy-Nagy Art and Design University in Budapest. She is currently a member of the research project Rethinking Intermediality in Contemporary Cinema: Changing Forms of In-Betweenness led by Ágnes Pethő (Sapientia University, Cluj). Ágnes is the local initiator of the international StoryCode (storycode.org) network since 2017. She is also one of the main organizers of Zip-Scene Conference. Analogue and Digital Immersive Environments taking place at Moholy-Nagy University of Art and Design, Budapest between 8-10 November. Her latest publication: How Interactivity is Changing in Immersive Performances. In: Nunes N., Oakley I., Nisi V. (eds) Interactive Storytelling. ICIDS 2017. Lecture Notes in Computer Science, vol 10690. Cham, Springer.